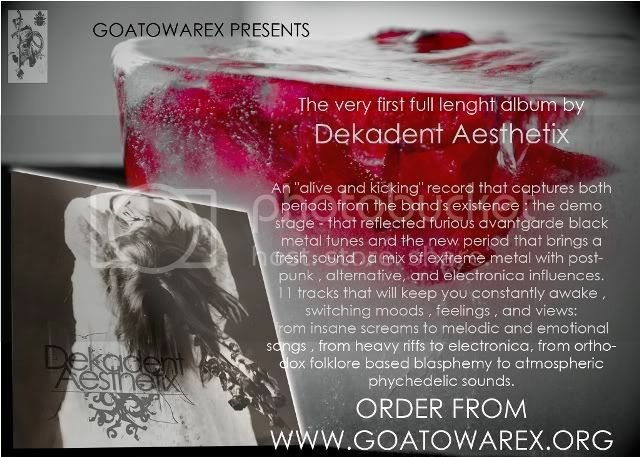 After the split vinyl with the legendary norwegian band Joyless,the first full length album from Dekadent Aesthetix features all of the band's work to date. It captures both the first aggressive black metal compositions from the demo times as well as the new experimental work. All the songs including the first compositions are now mastered by Dan Swano in Unisound Stodio and re-arranged resulting in a fresh new unheard material. This release comes with 50 T-shirt in two colours (Black/White). Great news! It will be interesting to hear that stuff. Songs from split with Joyless and tracks from their myspace sounds really good and very original.